For more than a century, Americans have braved the July heat to celebrate our Nation’s independence with festivities ranging from parades and festivals to family gatherings and backyard barbecues. It’s a time to sing “The Star-Spangled Banner,” honor the American flag, and reflect on our Nation’s history. 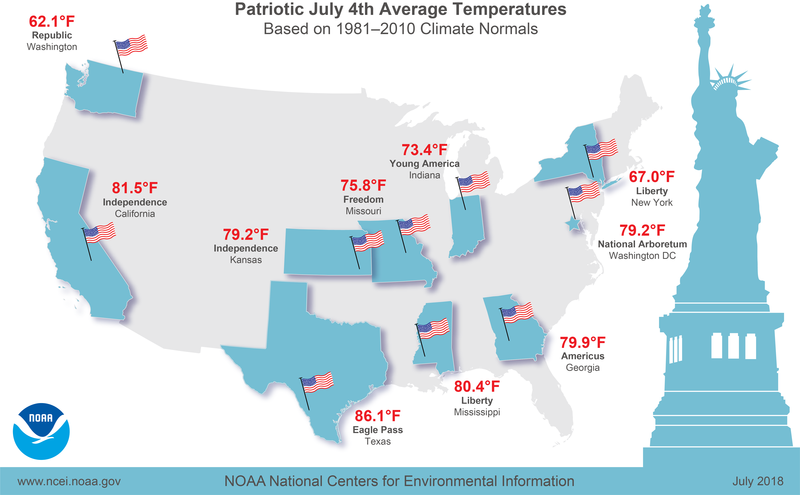 So, in honor of Independence Day, we take a look at the country’s historical July climate conditions and Climate Normals for several patriotic-named U.S. locations. Heat is the key characteristic of America’s July climate. And, in many parts of the country, it’s accompanied by sticky humidity, afternoon thunderstorms, and possibly severe weather. It marks the second month of the North Atlantic hurricane season, and it’s typically the fourth most active month for tornadoes. Climatologically speaking, July is the hottest month of the year for the contiguous United States with an average temperature of 73.6°F. The average daytime high temperature is nearly 87°F, while the average nighttime low is around 60°F. The hottest July—and subsequently the hottest month—on record for the contiguous U.S. occurred in 1936 during the Dust Bowl. 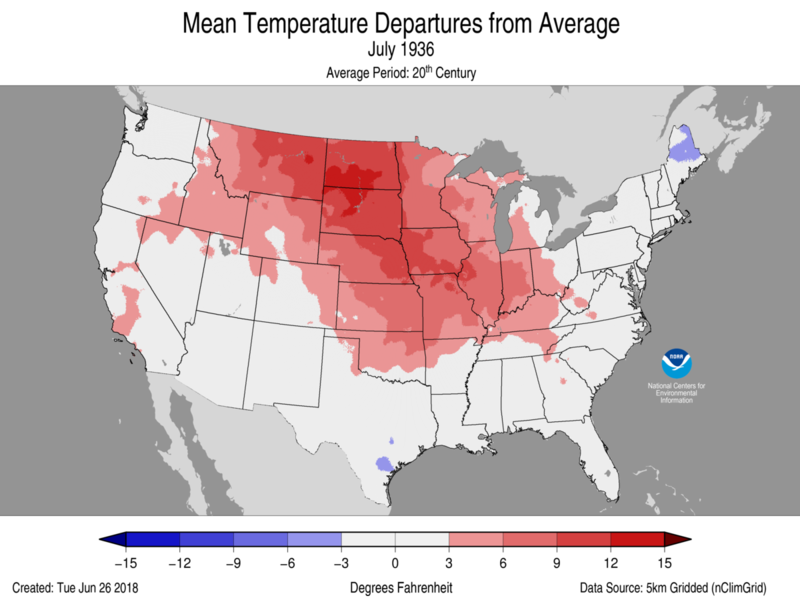 The July 1936 average temperature was 76.8°F, 3.2°F above the 20th century average. The hottest monthly average temperature for any state in our 124-year record occurred in 2011. The Oklahoma July 2011 average temperature was 89.2°F, 7.5°F above average. But, on average, Texas is typically the warmest state in July with an average temperature of 82.3°F. 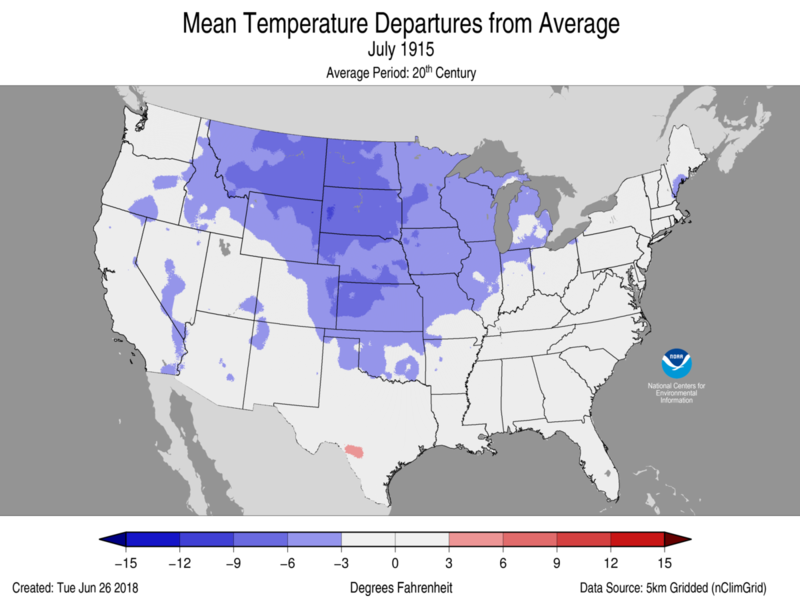 The coldest July on record for the contiguous U.S. occurred in 1915 with a temperature of 71.0°F, 2.6°F below average. Washington state is typically the coolest state in the Lower 48 in July with an average temperature of 64.0°F. The July temperature for the contiguous United States has warmed at an average rate of 1.1°F per century since 1895. The rate of change is double that at 2.2°F per century since 1950. Climatologically, July is the third wettest month of the year for the contiguous United States with an average of 2.78 inches of precipitation. 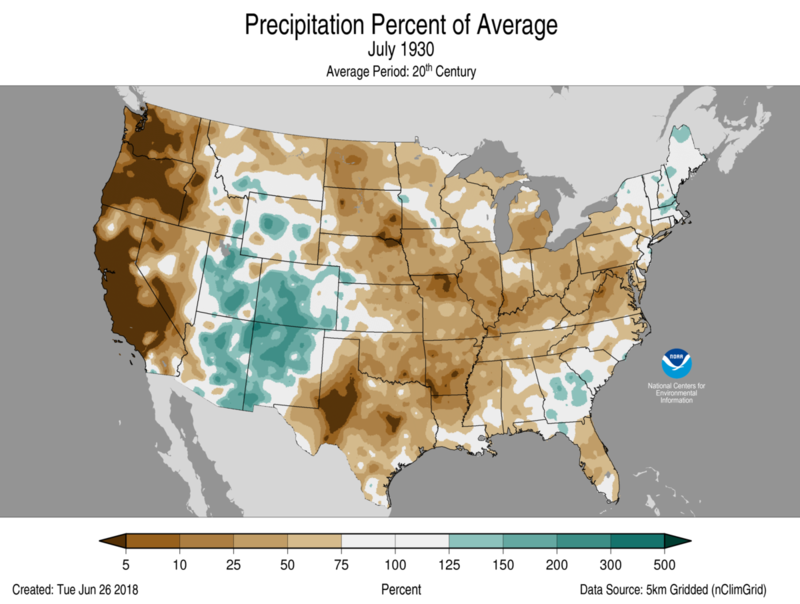 Both 1950 and 1958 tied for the wettest July on record with a nationally averaged precipitation total of 3.86 inches, 1.08 inches above average. The contiguous United States saw its driest July in 1930 with an average of just 1.79 inches of precipitation. July begins the second month of the North Atlantic hurricane season. On average, July typically sees one tropical storm every year, a hurricane once every other year, and a major hurricane about once a decade. The year 2005 saw the most tropical storms in July with five named storms: Cindy, Dennis, Emily, Franklin, and Gert. In a three-way tie for the most hurricanes during July are 1916, 1966, and 2005, which each saw three. And, 1916 and 2005 tied for the most major hurricanes during the month with two each. On average, the contiguous United States experiences 134 tornadoes during July with the activity focused in the Northern and Central Plains and Midwest. 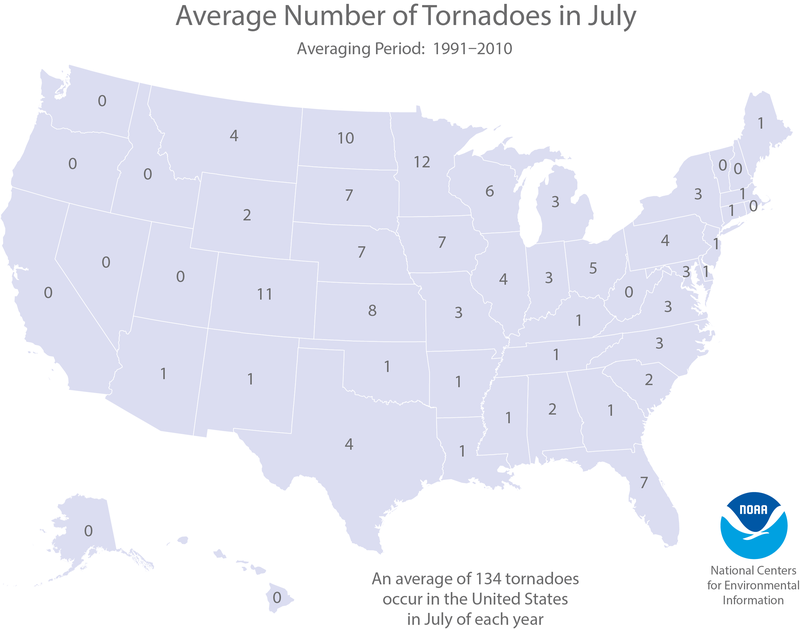 The most active July occurred in 1993, when the country had 242 confirmed tornado reports. The least active July occurred in both 1950 and 1951 when 23 tornadoes were reported. More recently, only 37 tornadoes were reported in July 2012. Since 1980, eight severe weather outbreaks have each caused more than $1 billion in damages during July. In such a geographically and climatologically diverse country, average conditions can vary from day to day and from place to place across the United States. From the balmy warmth of Independence, California, to chilly Republic, Washington, the table below shows the normal minimum, maximum, and average temperatures on July 4th for 10 locations with patriotic names, according to our daily 1981–2010 Climate Normals data. While our Climate Normals provide average temperatures throughout the United States, the actual conditions this Independence Day may vary widely based on weather and climate patterns. For prediction of your actual local daily temperature, check out your local forecast office on Weather.gov. According to the August 7 U.S. Drought Monitor, moderate to exceptional drought covers 30.2% of the United States.